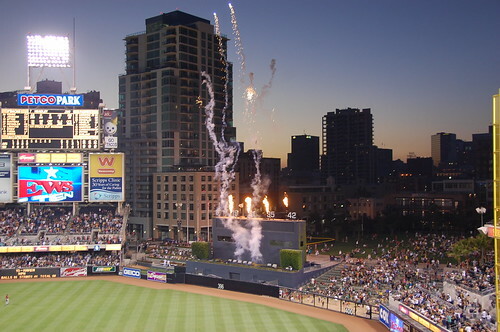 It is with complete sincerity that I assert that PETCO Park is the most underrated ballpark in the country. On a trip to visit all the parks in California, this was not a place I was particularly excited about; the Padres were in town and it was a way to tick the park off the list. Now that I’ve been there, I can’t wait to go back. 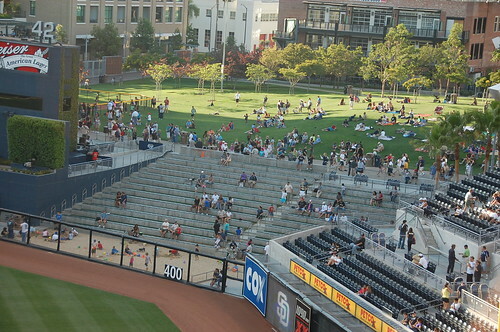 PETCO is the most laid-back downtown ballpark you will ever visit. 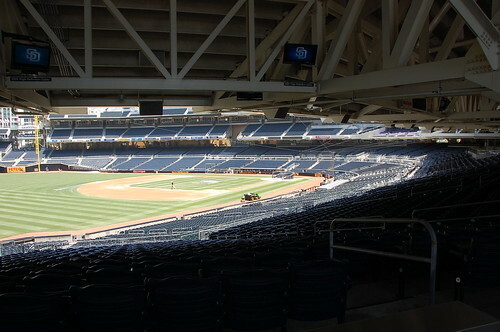 You can walk there or take public transportation; it’s a stone’s throw from the ocean, but backed up by a rich entertainment district that’s an actual part of the city, and there are quite literally seats for every budget and every ballgame agenda. It will remind you of parts of other ballparks, but yet, it’s not like any other ballpark out there. 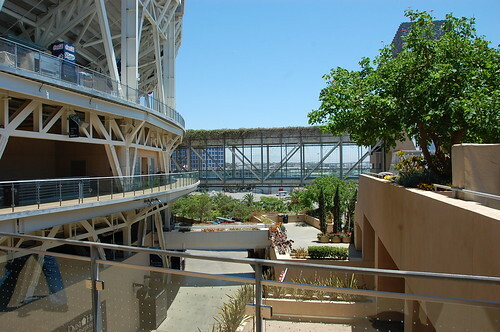 The exterior will throw you off at first, made of local sandstone, it looks more like an upscale mall or an office complex than a ballpark. 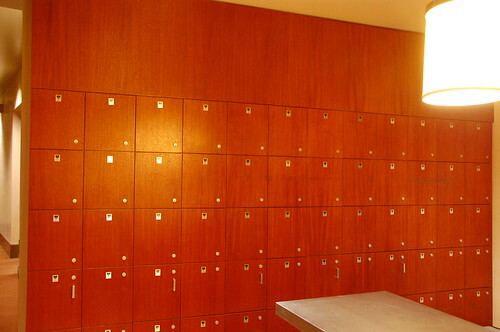 There are interior passages that will remind you of that as well. It’s decidedly pleasant, but also decidedly non-baseball. The other thing that will throw you off is how so much of the walkways are exposed to the elements on all sides. 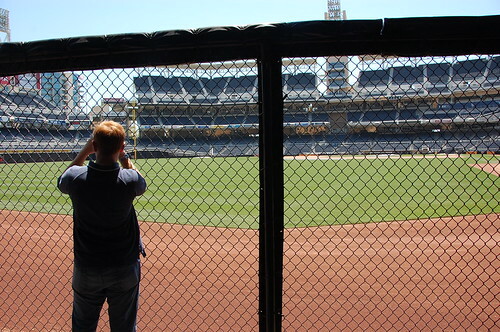 Given that you can count on two hands the number of games called on account of weather in the Padres’ history, it makes sense: why trap people inside passageways when you can take advantage of the gorgeous San Diego weather? Instead of going retro, like a Camden or a Safeco, they went modern; the interior will remind you of Target Field… except, of course, for that brick edifice out in left field: The Western Metal Supply building. 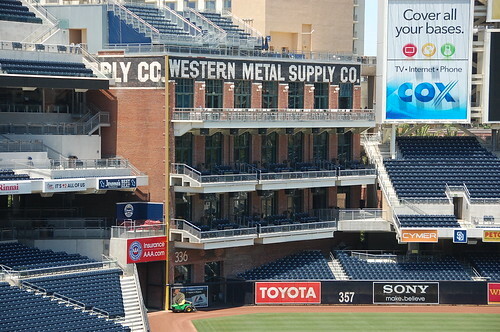 If you’re a fan of a NL team and have a good color guy doing your team’s tv broadcasts, you will undoubtably know by now that PETCO was built as an extension to an existing structure, the historic, cant-be-torn-down Western Metal Supply building. Inside Western Metal Supply you have your team store, as well as a bar thats open to the public and event spaces. They pay tribute to Wrigley with the bleachers on the roof, and the left field foul pole is the corner of the building. It’s incongruous, a little, but it works. The top floor is the public space open to anyone, which includes an exhibit to The balcony in the public bar is open to anyone, first come, first served. They used to let people spend the whole game out there until things started to get a little territorial, and then they instituted a rotation – from the start of the game until the 3rd inning, and then from the 4th to the end of the game. The fact that you could buy a $5 park pass (more on this later) and head up to take your turn in those seats is just fabulous. The press box was absolutely glorious. I don’t want to hear a beat writer ever complain about a San Diego series. Ever. I wasn’t a big fan of the field level concourse. It felt a little too cave-like. I’m not sure I’d like sitting in the higher rows of the field level. Maybe it’s different when you’re sitting as opposed to standing. 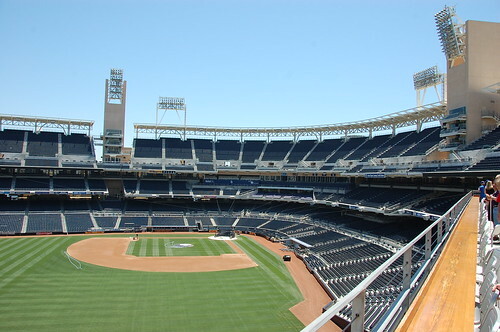 Speaking of standing, there are standing room rails all over the ballpark, and, again, anyone can avail themselves of those positions, whether or not you’ve purchased an actual seat, or whether you’ve paid $5 for access to the park behind PETCO. It’s an actual public park that’s open to anyone until 4 hours before game time. Then, access will cost you $5. There are concessions, bands, a wiffle ball field and as you might expect, dozens and dozens of children running wild. There’s also a lovely statue of Tony Gwynn. 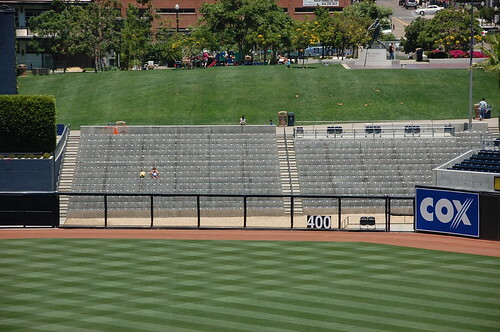 In front of the park and bordering the right field fence is a seating area called “The Beach”. It’s bleacher-like, with sand, grass and bench seating. 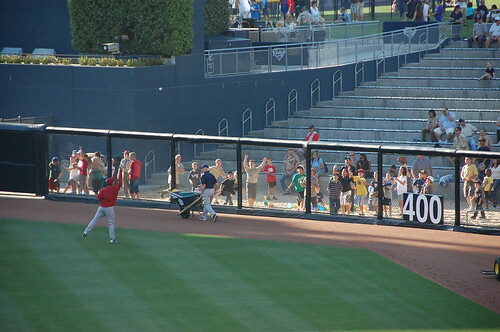 Kids run around the sand pit during BP as players toss balls over the fence. The activity is strictly limited to children and it’s enforced by Padres personnel. It’s wonderful to watch a genuine, joyous scramble that’s not full of professional ball hawks. The players seemed to enjoy it as well. The home bullpen is on the other side of the batter’s eye, which is where you’ll find the retired numbers. I found them to be a little lonely and awkwardly placed. It was cool when they had flames in the background for the home run celebration, but that doesn’t happen at PETCO that often. 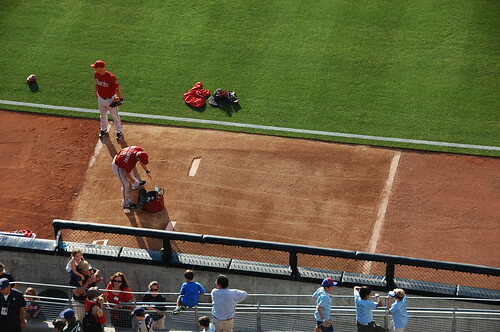 The visitor’s bullpen is on the field along the first base line. 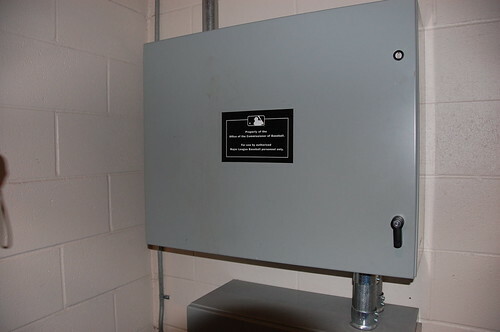 These are the magic boxes that the umpires use when reviewing home run calls! Sitting to watch a game was pleasant. Since it was not a game we cared about, we did not buy tickets in advance but instead bought seats to that night’s game right before the tour. We could have purchased a seat in just about any location, but decided that $21 was our pricepoint. That got us seats in right field just above the visitor’s bullpen, in the second row of the upper deck boxes. People arrived late, California style, but there are definitely some dedicated fans – including some that dress like the mascot. 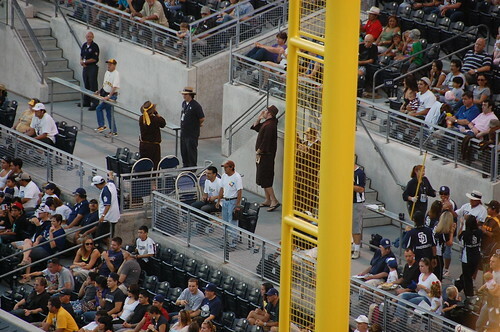 The mascot is the Swinging Friar. He is active, but when we inquired as to Swinging Friar memorabilia for our collection (like a doll or a bobblehead), there was some eye rolling. The best we could do was a keychain. 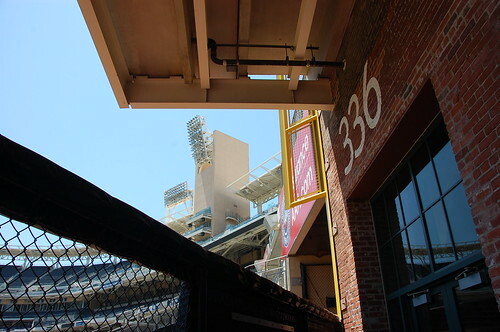 Getting into the ballpark was a little odd, as the left and right field entrances take you into small covered concourses and you have to walk up ramps to get to the field level. It was a little claustrophobic and would definitely give you a bad impression of the place if you hadn’t been there before and seen how open and inviting the rest of was. Speaking of open and inviting, BP access is open; there’s nowhere you can’t go except the seats behind the net directly behind home plate. A+ for that. My view of the field would have been lovely except for that dreadful scoreboard. I’m not even talking about the antiquated video board, but rather, the clunky erector-set feel of the entire assemblage. Also, I hate a ballpark that doesn’t have the team’s logo prominently displayed at all times. 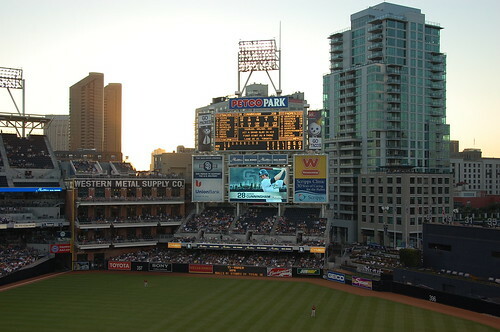 There is nothing that says PADRES anywhere on the scoreboard when it’s not lit up, and the PETCO logos just looked half-baked. You could easily fly into San Diego for a series and not ever need a car. There are dozens of hotels, many in walking distance (the Omni connected to the ballpark by a walkway), and others a quick ride on the trolley. The airport is less than 10 minutes by cab from downtown, and there is no shortage of bars and restaurants between downtown and the ballpark. Your chances of the game being rained out are slim and none. And, if you want a non-baseball distraction, there are many, many tourist attractions in the area, from the San Diego Zoo to Legoland. Yes, I am already planning my trip back. 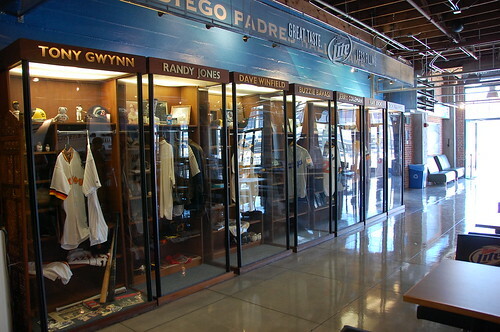 I can’t believe the guide didn’t at least mention Randy Jones BBQ a staple for the Padres since at least the 90’s. Still there are a TON of places to go. An ideal trip would consist of going from mission valley (near quallcomm stadium) going to Chevy’s or the Gordon Biersch brewery if that’s more your style, for happy hour. Then hop on the trolley to downtown and get off at the convention center stop and right there to the left is a terrific establishment with live bands and good food for not TOO much. ANd its easy walking distance to Petco. Thank you for the wonderful write up. I too have used my business travel time to satisfy my obsession of baseball, taking advantage of the opportunities to visit many baseball parks, minor & major. 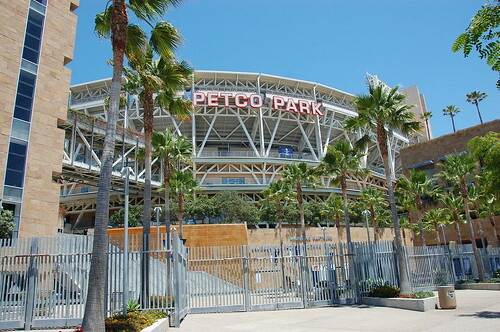 After having visited Camden, ATT, Fenway, Norfolk Harbor Tides….I was really disappointed when I first walked into Petco with all its white, sand and blue, but the place has grown in its beauty and charm with the lush greenery, magnificent waterfall and open breezeways — I have really grown to love it. It says San Diego living. 1) I apologize for your guide not recommending Randy Jones BBQ – signature food, that has been a part of the Padre fare since the days at the Murph. The hot dogs beat out a Dodger Dog, any day, both in size and flavor. My favorite recommendation is Rubio’s fish or shrimp taco, SD home grown fare, which were actually located just below where you were seated. 3) If your visit happens to fall on a Sunday, then the Breakfast at the Park should not be missed. Shaded tables are set up on the outfield warning track. You not only get that up close and personal experience with the field, but with each team’s players performing their warm ups on the field and the pitchers in the bull pen it is a can’t miss experience. Each Sunday brings another surprise of who may stop by to eat with you – from CEO Moorad, COO Garfinkle, Padre players, and of course the mascots, The Swinging Friar and Petco’s dog, Ruff and cat, Muew. Heath Bell is our regular favorite. It opens at 1030 on a first come, first served basis. 4) Also on Sundays from 1130-Noon, two Padre players sign one item for children 14 and under. 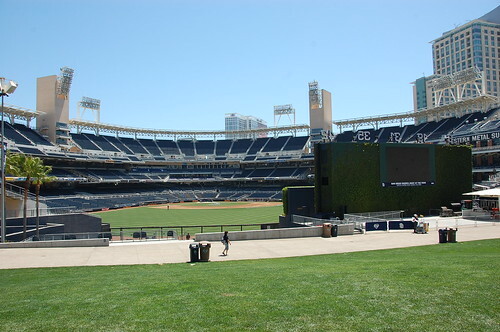 5) The Park in the Park can’t be beat for either playing in nor taking in all the away games which the Padres broadcast for free on the big screen. 6) One correction: the tiles are not made from local sandstone but are actually from India chosen to match the sand color of our local La Jolla cliff colors [no harvesting sand from this coast] The result is a tile that changes color with the sun’s position and is especially beautiful lite up at night with the home plate waterfall running over them and into the pools. 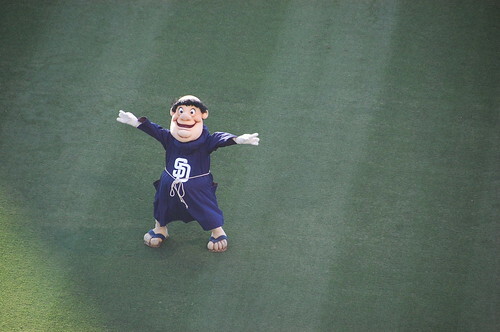 And last but not least, there are stuffed Swinging Friars in the many Padre stores around the park. I have only seen the bobble head as a giveaway a few years ago along with the SD Chicken :) If you are really interested in one and want to send me an address, I will mail you one as a thank you for the great article. Looks like someone beat me to naming Randy Jones’ BBQ. 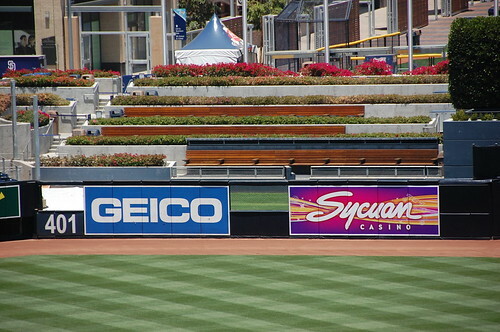 There are two locations one along the outfield and one behind the home plate area. You want to eat from the one before home plate. What you want to get is the BBQ Brisket Sandwich. Ask for a hot one, you’ll love it. Thanks, everyone, for the tips for when I make my way back to the ballpark. I’m kind of picky when it comes to BBQ – visiting Kansas City was an embarrassment of riches – but I’ll definitely give it a try next time. JJP, we still do need that Swinging Friar so I will be dropping you a line! Thanks to Ducksnorts, Gaslamp Ball for the linkage and to the rest of you for your comments! 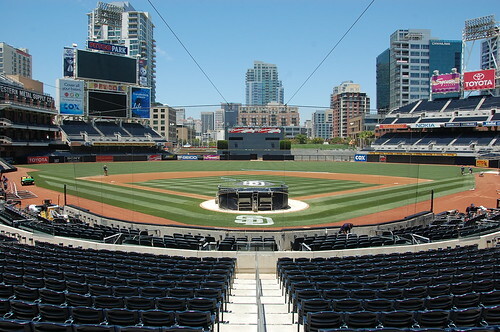 I loved your review of PETCO park. Especially your assertion that it is the most underrated of all the ballparks. 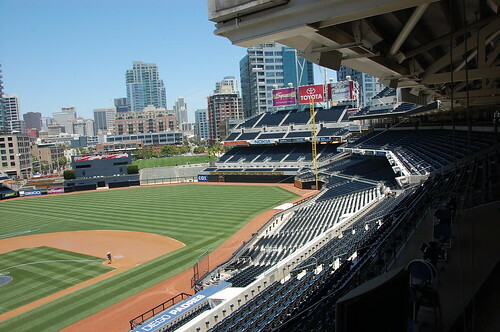 It’s difficult for me to grasp how people from outside of SD view PETCO. When it was first opened in 2004 I felt as if it was the cream of the crop. The best of the new ballparks. But somehow it never received that type of billing from the national media. I am still unsure as to why that is. I have been to Wrigley and Fenway and consider both of those to belong in a different category. 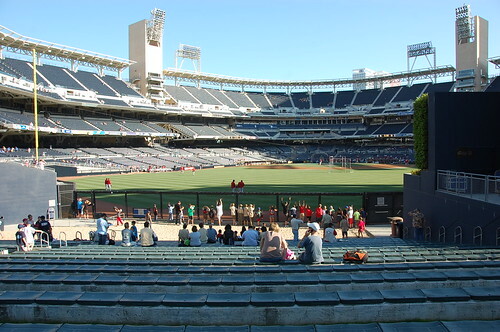 The only parks i can compare PETCO to are, Jacobs field, Chase field, AT&T, Dodger stadium, Angel Stadium, The Ballpark at Arlington and Safeco (which I toured but didn’t see a game at). I feel like PETCO is superior to all of those. Like the other commentators I am sad that you weren’t directed to RJ’s BBQ or Rubios fish tacos or even the the food up in the Western Metal supply company bar. They have terrific make your own nachos, and carving board sandwiches. The sushi is pretty good too. There are literally tons of premium dining options and while few have the stand out uniqueness of say chicago deep dish or SF’s garlic fries they are still of very high quality. I go to as many games as possible at PETCO (maybe 20 a years) and I keep score each and every game. If you go to the guest services desk they will give you a scorecard with the lineups already printed in and lot’s of terrific game notes. It’s like a mini media guide and it’s totally free you just need to ask. Also this year they started giving away free programs called the Padres Blue Print. They too have a free scorecard in them. I had never thought about the awkwardness of entering at left and right field but you are correct those entrances are rather quirky. The main home plate entrance though is absolutely beautiful with the grand staircase adjacent to a waterfall. 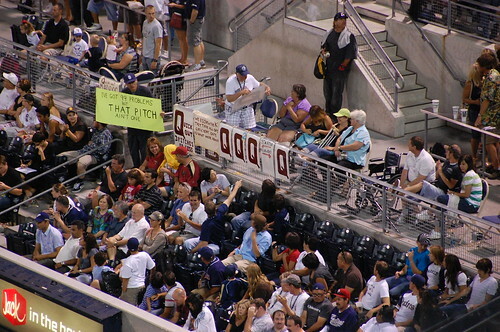 I hope you come back and if and when you do please let me know so that I can join you and give you a fans tour of PETCO.